This is the stack of envelopes we have to send out today. This is the second stack we've had like this, and we're buring through our sticker reserves like mad. However, this is a good thing! We want you guys to get your grubby little hands on as many of our stickers as is possible. We're going to re-order another batch of them today, so that we can keep the love flowing. We're not out yet, so keep your envelopes coming! If we run out, we'll just wait until we get the next batch to send it out, which shouldn't be more than a week or two. Also, thanks for all of your donations! Everyone was so generous, and we tried to hook you up with as many stickers as we could to show our appreciation. Here's a few things that you HAVE to think about when sending your envelopes:1) For weird legal reasons which I won't bother to get into, any donation cheques sent MUST be made out to NS Management. It's our legal company name, and we manage the site of newschoolers.com. So cheques made out to Newschoolers.com will just get sent back to you. It confuses even me, so don't feel bad if you screwed it up. 2) US stamps - They DO NOT work in Canada. You must go to your post office and get an International postage voucher. It is the ONLY way to send a letter from Canada. If you have sent an envelope with US postage on it, and don't recieve your stickers within the next week or so please contact us and we'll try to sort it out somehow. We'll fix the ones that we've already recieved, but make sure that in the future please just get the voucher... or include money for postage or something...3) Put a return address on the SASE. Use our address, the same one you're mailing it to. This way if there's a mistake with the postage, address, weight or something like that your stickers won't get lost in the mail. There may be a few that have already gotten lost, so once again wait for a week or two, and if you haven't gotten anything contact me (mr.bishop@newschoolers.com) and I'll get it sorted out for you.4) Keep it coming! We want to send out as many of these things as you guys want. The faster we burn through them the faster we'll order more. 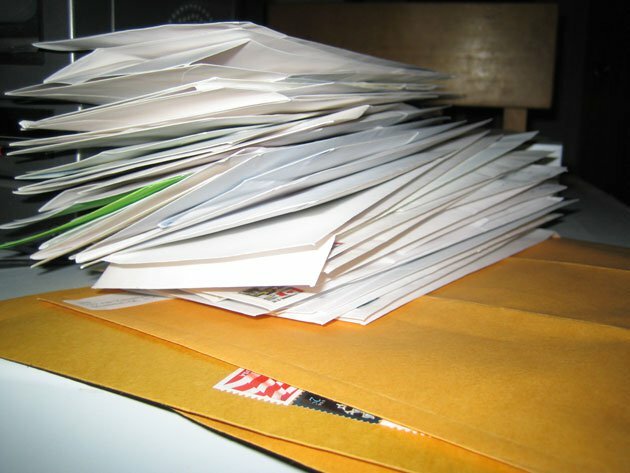 5) If you send a donation, be sure to include your NS membername so that we can hook you up with your proper donating status!We spent most of today stuffing envelopes, and we're stoked at the number of people who have donated money to the cause. Donating gets you a good pile of stickers (10-20 depending on how much you sent) and we'll put that money directly back into more stickers. Over time we'll be able to send out more, and have a larger selection of styles available. Thanks again everyone, and I hope you enjoy your stickers!